If you want to see guys in a speedo this is the right place. When in Rio, the beach is a must. The two largest and most famous beaches in Rio de Janeiro are Copacabana and Ipanema, both are crowded with little space between people, and have different postos or sections with fine sand. The people play soccer and volleyball and a lots of other activities going on an butts everywhere of course. Lots of bobbing silicone breasts and you will probably notice why Brazil is No 1 country in plastic surgery. The beach is bordered by Atlantic Avenue. The over 60 kilometers beaches are not the place where you can read a book half asleep and there are even outdoor gym for people who want to flex their muscles. Along the Copa Cabanas white beach and classic and famous wavy pavement there are many hotels and restaurants Copa Cabana stretches across 3 km and looks the Guanabara Bay and gives a fantastic view of the Sugarloaf Mountain. You have Copacabana’s Posto 6, furthest towards Ipanema with the cool beach people. The red light district is located on the Copacabana boardwalk. Maybe you have heard about the tall, young, beautiful and brown girl from Ipanema? Ipanema is more residential, saferand counted as more fashionable and trending than Copacabana. People go rollerblading while they tighten the muscles and often more than 30% of the women wear thongs. Posto 9 is hip. Posto 10 you find skaters and girls with right T-shirts. Rio has it’s famous gay beach section with the rainbow flag after Posto 8 and directly outside the Armeodo Rua Farm is the largest gaybeach throughout Brazil. 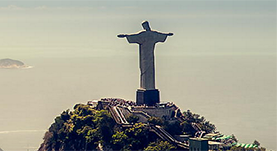 Rio was chosen as the sexiest gay destination in 2010 by TripOut Gay Travel Awards. At the gay beach you will find good-looking men playing volleyball and several who have gone through plastic surgery just to get nicer breasts. Close to Ipanema at the underground Station General Osório / Ipanema you can take the elevator up to Cantagalo and visit the terrace Mirante do Paz. Arpoador (near posto 7) is the most talked surfing beach in town and meeting place for all young surfistas and at the beaches of Barra, Recreio, Joatinga (Praia do Joa) a 220 meter long beach, and the red beach Grumari, and Macumba with large waves wich is the Mecca for surfers – you’ll certainly find some surfers here. ASP World Master Championship was held at Arpoador in 2011. Read more about surfing at Rico Surf. 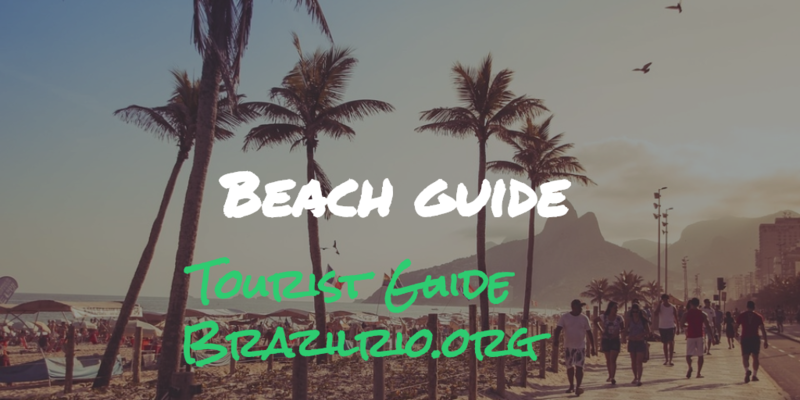 You probably want to spot beautiful people at the beach and then you should go to exclusive Leblon, directly below the district Leblon, where you will find the wealthy and rich people. São Conrado is famous for its hang gliding and fashion mall with over 150 stores and it is close to the largest favela Rocinha. Pedro Bonita is launching pad for the delta wing flight. Landing is at the São Conrado beach. Wide park with skateboarding, jogging, soccer museums and large marina. Barra da Tijuca is three times as long as Copacabana, filled with the drive-middle class, plus a large part of the sportiest clientele. 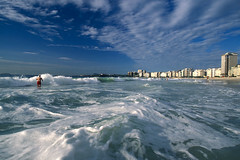 It is an area a little further away in Rio with beaches a little higher and perfect for surfing. 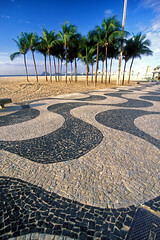 The beaches in Rio are also known for their New Year celebrations also called Reveillon. New Year’s Eve is one of Rio de Janeiro’s most important celebrations, second only to Carnival in popularity. The event attracts over 2.5 million of people to Copacabana every year! At Hotel Copacabana Palace the New Year’s Eve party take place in Nobre, Golden and sea-view rooms starting from 8 pm. One great place is Forte de Copacabana (Copacabana Fortress). The second most visited place in Rio de Janeiro, the Copacabana Fortress, is located between the two most famous beaches. Many want to leave Rio for a few days? If you have time and a car, you should go to Prainha. Northeast of Rio you also find one of the hottest beaches throughout Brazil – Búzios. Búzios is a peninsula that extends out into the ocean with 23 beaches and is known as “Rio’s Saint-Tropez”.